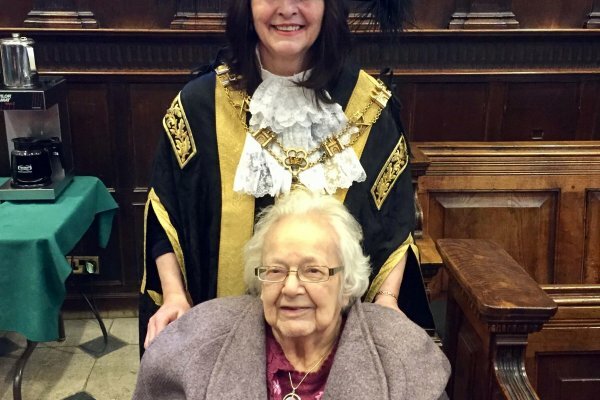 Dove Tree resident, Joy Lovell, was invited to join Mayor Cynthia Thompson at the Guildhall in Exeter, for tea last Thursday morning. They were joined by other local residents who remember the Exeter blitz of 4th May 1942. Joy was 12 years old and living on South Street, which was heavily bombed - 52 shops on the street were demolished that night. The Mayor gave a very moving speech, read some poetry, and talked about her own family's memories of the night that killed 156 and injured 563 in Exeter. We then took Joy on the short stroll from the Guildhall to the top of South Street, which has now been completely rebuilt. It was an emotional morning for Joy and the others, but wonderful to be in their presence as they reminisced about their amazing lives in the city.